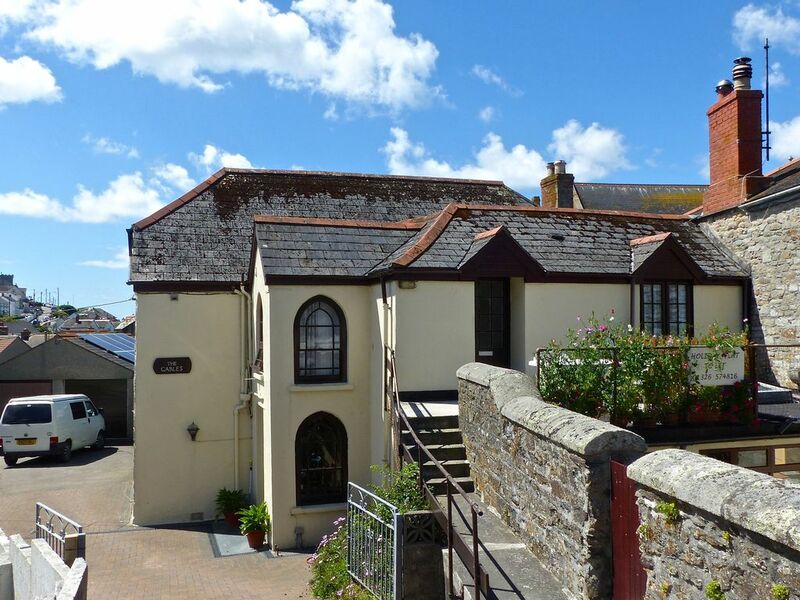 The 2 bedroom self catering apartment in Porthleven, South West Cornwall is on the first floor of this large character cottage in the conservation area of Porthleven, and has its own separate entrance. There is a balcony with table and chairs, and off-road parking for one vehicle is provided in the grounds of the property - a rarity in Porthleven. The holiday property is close to the harbour and local amenities. Well behaved dogs are welcome by prior arrangement*. Saturday changeover. The 'Gables' is one of the oldest properties in Porthleven, SW Cornwall. It is privately owned and divided into two flats, with the proprietors living on the ground floor. It is close to shops, cafes, restaurants etc. and only 2-3 minutes walk from the picturesque harbour, beyond which is the beach. The accommodation sleeps 5 people and comprises: balcony, lobby, dining area, kitchen/lounge, shower room with WC and wash basin. There are two bedrooms. The large main bedroom has a double bed and a single folding guest bed bed if required. The 2nd bedroom has a triple sleeper bunk bed, i.e. a 4' wide double underneath a single upper. Facilities include: satellite TV, DVD player/recorder. wi fi, electric cooker, microwave, fridge/freezer, electric convector heater and fan heaters. In the event of cold weather, central heating is provided. Electricity is by coin operated meter which takes £1 coins. There is off-road parking for one vehicle. There is a selection of DVD's available to view and also some books. Porthleven is a picturesque fishing village nestled around its own harbour in Mounts Bay on the south coast of Cornwall. Just past the harbour there is a long stretch of beach almost 3 miles long. Local services include: 3 public houses, Post Office, launderette, takeaways, shops, cafes and restaurants, local craft workshops, supermarket, church and chapel, small outdoor craft market in summer. There are lovely local walks and west of Porthleven, along the cliffs, the scenery is stunning and in the distance one can see the ruins of the old copper mines. Close by, to the east, is the beautiful Penrose Estate, where one can walk through the wooded valley around Loe Pool, a large freshwater lake separated from the sea by a sandbar. Further Details: The apartment will be ready for occupation from 3.00 p.m. Changeover day is Saturday and you are asked please to vacate the property by 10.00 a.m. on the day of departure to allow time for cleaning etc. Please note that hire of bed linen and towels is not included in the price.However, if it is not convenient for you to provide your own bed linen we can supply this at an extra weekly cost of £8 per person. However, if you prefer to bring your own covers etc., for each double bed you will need to supply a double duvet cover four pillowcases and a sheet. The single folding bed and the top bunk each require a single duvet cover, pillowcase and sheet. *Well behaved dogs are welcome, but not on the furniture please. We also ask that you ensure your dog is not left alone in the property at any time. An extra weekly charge if £12 is made for a dog. As a 'Cornish maid' it was wonderful to come back home to Cornwall in 2001. I love living in Porthleven. The scenery is breathtaking and always changing according to the season. As soon as I walked into this house, it felt right and I knew I wanted to live here. It is old and has so much character as well as being in the heart of the village, yet set back from the road. and with parking. The Gables is full of character and although located in the heart of Porthleven, it has room for car parking in the grounds of the property, unlike many other holiday properties in the village. Shower enclosure, wash basin and WC. Free central heating provided in cold weather. There are fan heaters/electric fire provided. Bed linen and towels provided if required at a cost of £8 per person per week. However, you are welcome to bring your own if preferred. There is an extra charge for towels of £2 per person per week. Living room/kitchenette. A two seater settee and two armchairs, storage unit, occasional tables, electric convector heater. A four ring hob with a grill and oven under. An iron and ironing board are supplied. Table and 4 chairs provided in the dining area. An extra stool or chair can be provided if requested. Satellite TV provided with DVD player/recorder. DVD player/recorder. Selection of DVDs provided as well as some children's games. Small selection of books in main bedroom. Selection of children's board games. Bed linen and towels provided if requested at an extra cost of £8 per person per week. However, you may bring your own if you prefer. Wi fi available. Well behaved dogs welcome if kept off furniture and beds. Please note that dog is not to be left unattended in the property at any time. Flat is accessed via level walkway and 5 steps. Thanks. Glad you enjoyed your stay. The owners Alison & Mark were very welcoming and we found the apartment a great base for long coastal walks around Porthleven. The apartment was very clean and ideally placed close to shops, restaurants and the lovely harbour. We also made use of the outside sitting area to unwind at the end of the day. The off road parking was also a bonus. Thank you Alison & Mark. So pleased you enjoyed your holiday and we hope to see you again in the future. Very clean and comfortable plenty of room for 5 people. Well worth a visit. We were very happy with the accommodation,plenty of room even with 3 young children,just a couple of minutes walk to the quayside and shops. We will always try and book again if we are down Porthleven again. It was great to meet you all and hope we see you again in the future. Mark said it was nice to chat to Gary, especially about old vinyl. We liked the Gables. The appartment was located in Porthleven, a lovely small village in Western Cornwall. The hosts are extremally friendly, they helped us with our dirty clothes (we stayed two weeks) and were always ready to help. They live in the same house downstairs, but the entrance to the appartment is separate. Every week they brought us new live local flowers, which is nice. The appartment itself was spacious enough to host 5 people (the table was a bit tight for us, though), the parking lot was on the premises, which is usually not the case in Porthleven. We were traveling a lot this summer and stayed at different locations in England, The Gables was one of the best, we would definitely recommend it to everyone. It was lovely to meet you all and we are glad you enjoyed your stay with us. Shame the weather wasn't better! Thanks for your lovely review and we hope to see you all again in the future. I stayed in the cottage for a week with my husband and 3 children, aged 2, 8 and 9 and it suited us perfectly. The cottage has so many plus points. The owners are lovely, they had fresh flowers in the lounge and had put a camp bed in the main bedroom in case our youngest child wanted to sleep in with us. We got stuck in traffic and they even unloaded our food shop and put it in the fridge! The cottage itself is more spaciuos than it looks in the photos. The decor is slightly dated, but steeped with character and immaculately clean. The location is great, only a couple of minutes walk from the harbour. We had the most fabulous week and have already booked again for October. I could not recommend it more! Thanks for the lovely review and we look forward to seeing you all again in October. Porthleven is a picturesque seaside fishing village with a harbour and a long beach, situated in Mounts Bay, on the south coast of Cornwall, 12-13 miles from the Lizard and approx 22 miles from Lands End. The town of Helston is 2 miles away, and the towns of Falmouth and Penzance are within easy reach. Marazion, home of the famous St. Michael's Mount is about 20 minutes by car. There are lovely clifftop and woodland walks nearby. The Gables is in the heart of the village, close to all amenities and about 3 minutes walk from the lovely harbour, beyond which is the long sandy beach. Homeaway/Owners Direct are now charging a service fee of almost 8%. If you would like to avoid this, please DO NOT use their Online Booking system. Above rates do not include bed linen or towels. For each double bed you will need to provide a double duvet cover, 4 pillowcases and a sheet. The single beds each require a single duvet cover, two pillowcases and a sheet. However, if necessary bed linen and towels can be provided at an extra weekly cost of £8 per person. We do request that our towels are not taken to the beach. Rental is from Saturday to Saturday, except in low season. An extra £12 per week is charged for a dog.